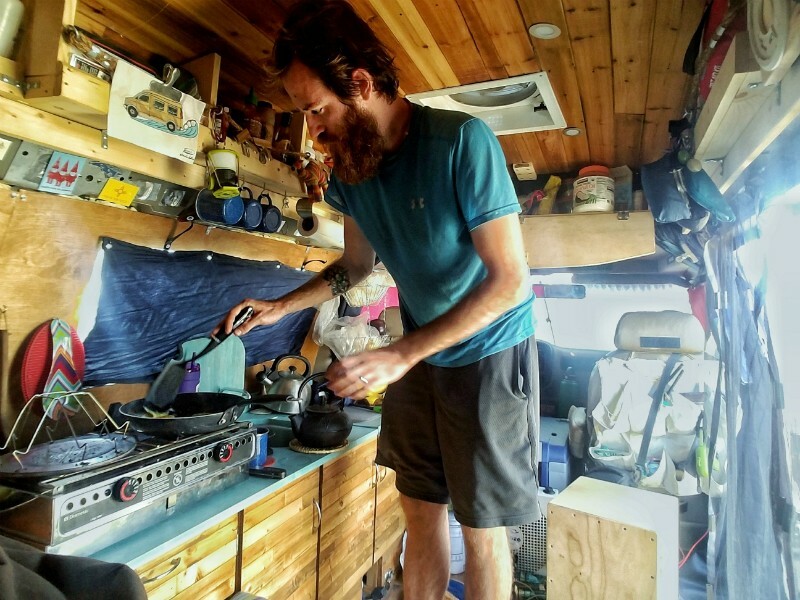 John Serbell fixes a meal in the van he and Jayme Serbell transformed into a home. During cross-country trips, drivers typically scarf down greasy fast food and sugary gas-station snacks. But for folks traveling with their own kitchen, road trip cuisine becomes much, much tastier. 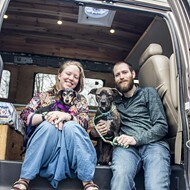 In March, former Affton residents John and Jayme Serbell transformed a conversion van into their permanent home and began exploring the United States. Ten months later, the Serbells have become experts in small-space meal-prep hacks, and they've released a downloadable cookbook to help others make the most of their own nomadic lives. "It's a very common question for people on the road," Jayme Serbell tells RFT on a phone call during the couple's drive from California to North Carolina. "'Where do you cook? How do you cook?'" The United We Van Cookbook features more than 40 recipes, created by the Serbells as well as other van dwellers the couple has encountered on the road. 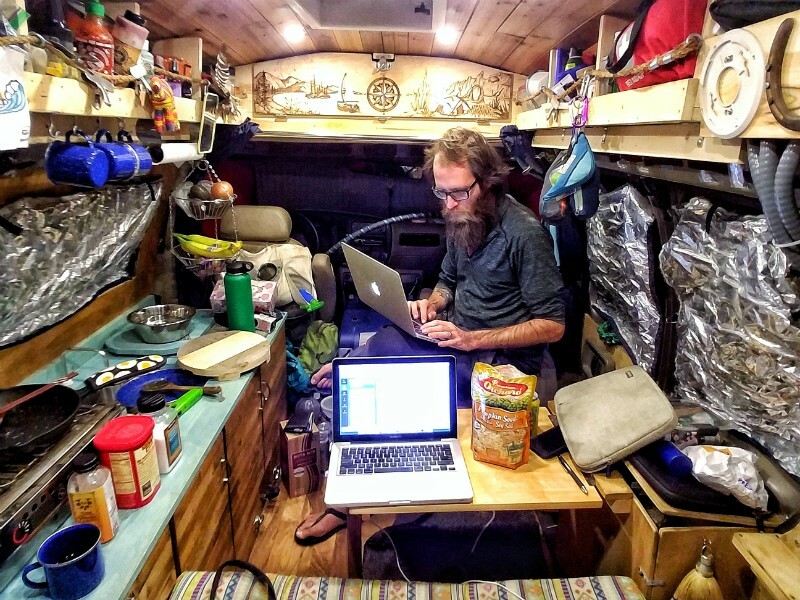 As the Serbells have discovered, space in van homes is at a premium, and cooks don't have the luxury of storing multiple pots and pans or stocking up on ingredients. The cookbook's recipes for one-pot meals, tacos, crepes and stir-fry dishes take that limited space into consideration and work for mobile homes as well as for tiny apartments. "People tend to be very passionate about food, and it's pretty amazing what people can whip together inside of a van," John Serbell says. "We've eaten better on the road than we ever have." Most of the appetizer and main-course recipes in the cookbook are vegetarian because plant-based ingredients are easier (and cheaper) than meat to obtain and store. The Serbells say that avocados, quinoa, eggs and lentils feature heavily in their meals, but their cookbook also encourages sourcing items responsibly from nearby surroundings. "There's one recipe from people who were living in their van up in Alaska," Jayme Serbell says. "It's a salmon salad bowl, and everything in the meal was stuff they had gotten in the wild." 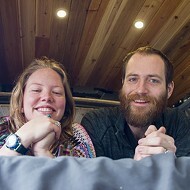 Jayme and John Serbell, who have been traveling the country in their van home for ten months, plan to sell their Afton home and make their new nomadic life together permanent. All proceeds from the $12.99 cookbook are being donated to the Nature Conservancy, a nonprofit that protects land and water around the world. Though the cookbook currently is download-only, the couple is looking into publishing traditional books at a later date. And the cookbook — which features recipes from Americans, Canadians, Australians and Europeans — is just the first of what the Serbells hope will be many projects focused on celebrating the van life community. Under the United We Van moniker, the Serbells are planning more opportunities to raise funds for nonprofits and showcase van-living skills. "We're talking about doing a bunch of future collaborations," Jayme Serbell says. "After we launched the cookbook, we had an outpouring of nomads worldwide who said, 'Hey, I wish I knew you were doing this. 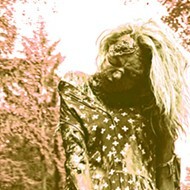 Here's my contact info for whatever the next project is.'" Whatever comes next for the Serbells, it won't happen in St. Louis. The couple is about to put their former Afton home on the market so that they can continue their road-warrior dreams for even longer. "We saw our first mountain range and were like, 'Nope, we can't go back,'" Jayme Serbell says. "Being on the road has been incredible, and we've been able to make it work," John Serbell says. "There's a big community of nomads. We've found our real home on the road." Download the United We Van Cookbook at unitedwevan.com and follow the Serbells' adventures on their Gnomad Home blog and on Instagram.